What are the PD/Hearth Sessions? The Hearth Sessions are organised by NGO's or Health centers in local communities, where there are malnourished children, to empower families/caretakers from poor background to use nutritious food, good health practices and take care of their children during childhood. The Sessions are based on the 'Positive Deviance' (PD) method, which identifies families/caretakers who are poor and use good nutritious food for their well-nourished children by using local food. The 'Hearth' or home is the location for the nutrition sessions. The Hearth Sessions are based on practices that are already being used by poor families, in the local communities, that have well-nourished children. The PD/Hearth programs started in the 60s in Haiti and have been used since then- at a bigger scale- in countries where there are malnourished children, Vietnam, Haiti, Egypt, Tanzania and other counties. All the Hearth programs have one aim to Nourish, Rehabilitate, Educate and help families/caretakers to improve the nutrition, health care and well being of their children. Why KARIBU care organises the Hearth Sessions? KARIBU care nursery school currently cares for the education, health and child development of 26 children in need, who some of them are orphans and others are half orphans. During school days the kids are being offered free meals, breakfast and lunch. The meals are prepared in the school and include a variety of foods greens, maize, vegetables, milk and meat, mainly food rich in vitamins, proteins and calories. When the kids are off school during weekends or school holidays, the caretakers are preparing the meals for them at home. This year, we noticed when the kids are staying with their caretakers for a long period of time (school holidays), when the kids come back to school they have various health problems such as worms, wring worms and in general they are less energetic and have showed poor performance in class, due to lack of vitamins and good nutrition at home. KARIBU care staff makes sure, at the beginning of each term, that the kids go under medical examination and provided with the necessary vitamins, medicines they need to recover. Although this is one way to help the well being and nutrition of children in need, it has shown that is not a sustainable one. Many people believe that by just offering free healthcare, food and education to children in need, are important for their upbringing and that we make a difference. This is true, but in order to make real difference to these kids life’s in a sustainable way, we need to pass this message also to their caregivers who are the ones bringing them up. Therefore, we don't just want to tell them what to do and what is best for their kids but learn from them, show them how to use existing practices that are being used in the local community and empower them through discussion forums . 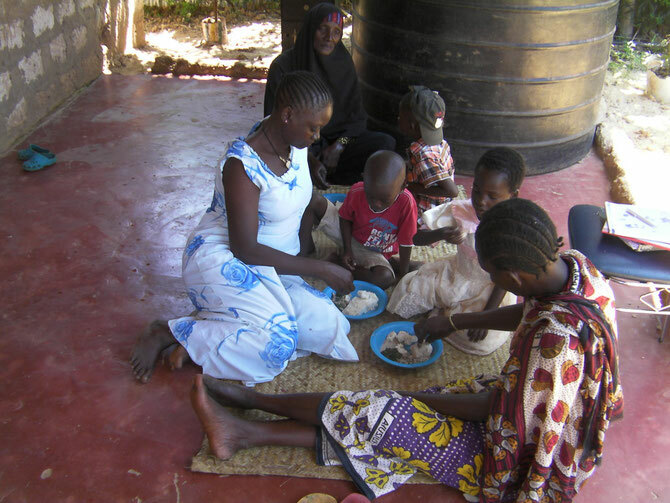 The Hearth Sessions are designed not only to teach and educate the caretakers to provide good nutrition to their kids through participation but also to empower the women/caregivers to use this method at home and pass the message throughout the community. As mentioned previously, Hearth Sessions are taking place in communities where there are malnourished children. The caregivers with their children participate in the Sessions , whereby the Hearth volunteers, spend time with them, showing them present feeding practices from other PD families, and have open discussions about good child care. After a period of maximum 10 days, the child is weighed and if it has added on extra weight from since the session started it can graduate but if it hasn't it is referred for medical examination. The caregivers seeing the difference on their child's weight can understand the difference a nutritious meal can make to the child's diet, and apply this at home. In our case, none of our children are serious malnourished but there are children which still lack of nutritious food and good child care from their caregivers. The PD/Hearth program helped us to identify them and we are organising the Hearth Sessions this month, to demonstrate, educate the KARIBU care caregivers, show them how they can use local food available in the community to create a healthy meal for their children and also to discuss with them issues about health, nutrition and the importance of good child care practices. The Hearth Sessions were organised by Stella Bili with the help of Hearth volunteers Christine Mwaluma, Sabina Gadoni, Nelly Botta, Elizabeth Kole, Ignebo Gregory and Eliud Ngosi.